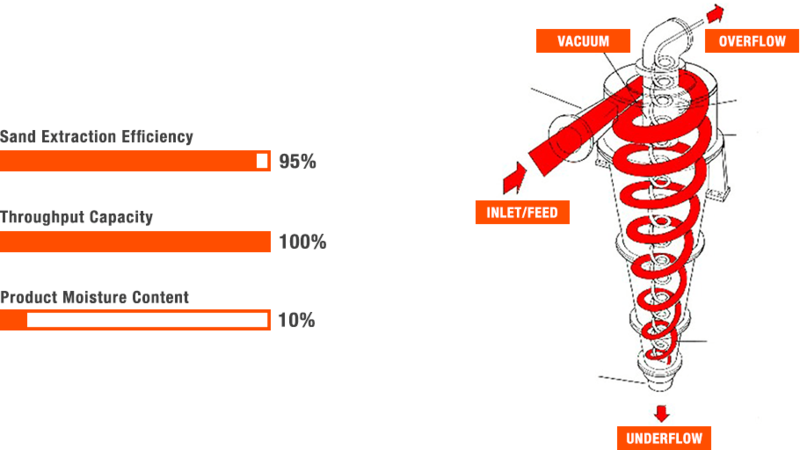 In a Sand Washing Plant context Hydrocyclones use Fluid Dynamics to separate different types of particles from each other; such as lighter silt and clay from heavier sand particles. Material that is heavier than the cut-point that cannot be overcome by the vacuum are discharged out the bottom as underflow. This is the desired product in concrete sand production as it contains the grading of sand that has been fed from the washing and screening plant with the all the silt and clay removed. Hydrocyclones extract with up 95% efficiency with the lowest loss of passing grade sand. 100% potential throughput capacity without any sand loss. Hydrocyclones can be run at full throughput capacity, efficiency does not decrease with more material. Coupled with an integrated dewatering screen, it produces sand with less moisture content. The MWS CSP range features a built in dewatering screen which means that off the moisture content is only 10% off the conveyor and can be sold straight away. Since the Hydrocyclones use water for washing and moving material through it, there are no internal moving parts, just water pumps. 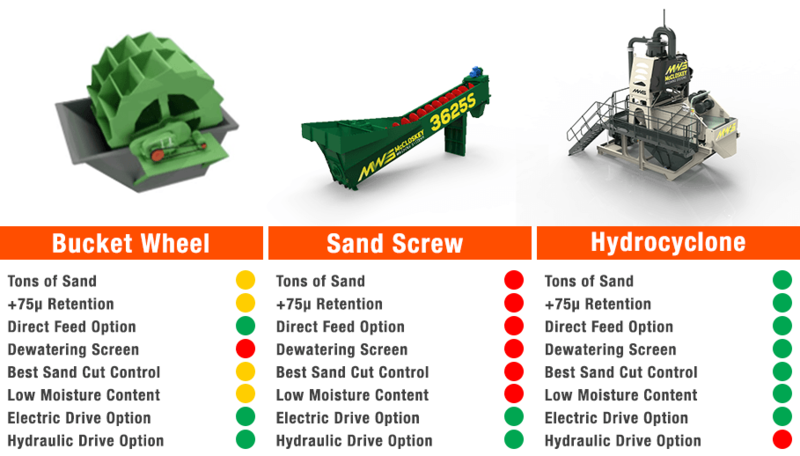 Although there is no 'one-size' fits all solution to sand aggregates there are a number of advantages to Hydrocyclone washing plant compared to traditional washing solutions. Sand screws have been used in washing systems for decades and when setup correctly produce results that make money, hence their continued use. They may have a rated throughput but can never been run at full capacity without losing valuable sand into the settling ponds. At best sand screws can be run 50% and could lose up to 30% of fine passing grade sand. They produce a very wet product with a moisture content around 25-28%. This must be allowed dry before sale. A much older style of washing system but still found in use in some areas. Their extraction efficiency is around 80-85% with the fine passing grade sand going into ponds. They produce a very wet product with a moisture content around 25-30%. This must be allowed dry before sale. If you're looking at washing plant and want to understand more of the principles behind washing and achieving the products you want get in touch and we can discuss your operational goals. See more of our MWS Washing Range here. Digital Marketing at Equip2, Simon writes about all things to do with Equip2. With a focus on innovation and technology in quarrying and the wider field of crushing and screening. 2018 Demo Day - The Beasts Are Back, Round up. [VIDEO] All new Portafill 9000JC Jaw Crusher - Crushing Alluvial gravel!